Is it a designer chair, or one destined for daily juice-box battles? The Nuna ZAAZ masters both, beautifully. 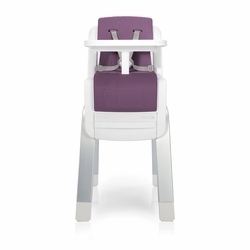 Built from the ground up with clever and practical design, our innovative high chair grows with your baby for years of chic yet sturdy mealtimes. The ZAAZ is exceedingly safety tested, comfortable, customizes to any size and matches your pre-baby lifestyle. Who knew mealtime could be so delicious?